Interviewed at Mishana Private Retreat Centre, Amazon Rainforest with Peter Cloudsley and Howard G Charing August 2005. 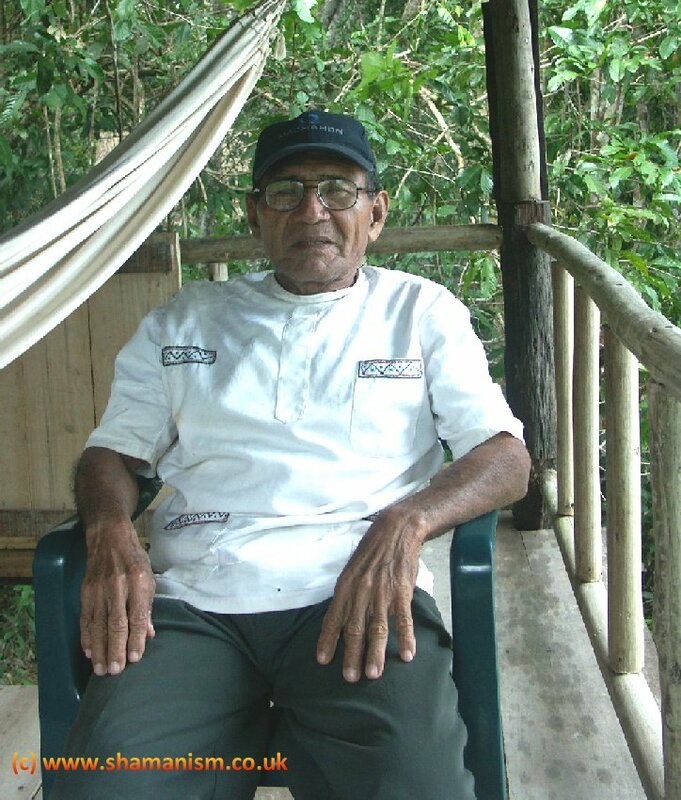 We interviewed Shipibo maestro Leoncio Garcia, a man in his mid seventies but with the appearance of a man twenty years younger. Again a testimonial to the youth giving qualities of Ayahuasca and the plant medicines of the Amazon Rainforest. I didn’t become a shaman until I was 50, I am now 74. I was always so busy working in the chacra, or cutting wood, it was only when I began to get a bit older. Until then I had taken Ayahuasca for all the usual reasons of health, but that was all. After deciding to do the diet I drank Ayahuasca seriously but I didn’t see anything and didn’t think I would learn anything but still I kept on drinking every night and didn’t sleep. With just one day to go before completing three months’ diet, I had a tremendous vision and I began to chant and continued all night until dawn. I saw under the earth, under the water, and into the skies, everything. Probably I was learning from the sprits during the diet but I didn’t understand. After that I could see what the matter was with people. I dieted pinon Colorado and tobacco first and then tried all the other plants. This was in San Francisco, a Shipibo community on Yarinacocha, Pucullpa where I was born. After this I went to Huancayo for six months to try my medicine. Then I went to Ayacucho and then a Senor took me to Lima to heal his wife. After two months I was taken to Trujillo and then Arequipa, Cusco, Juliaca, Puno. Everything worked out well and I worked with a doctor once who was not very successful and soon there were people queuing outside her consultancy. Eventually I came to Iquitos in 2000 and I haven’t had time to return to my family since then, I just send them money. When I go round to people blowing tobacco smoke it is to give them arcanas, to protect them so that when things happen around them it doesn’t hurt them or make them ill.
Leoncio tells a Shipibo (cautionary) myth. There was once a wise man called Oni who knew what each and every healing plant could be used for. He knew all their names and one day he saw a liana and recognized it as Ayahuasca and he learned to mix it with Chacruna. One night he tried it and learned so many things that he carried on drinking it. But because he went on drinking so long and often he stopped eating and drinking, and just chanted day and night. Now he had two sons and they said ‘come and have breakfast Papa’, but he carried on drinking Ayahuasca and when they tried to pick him up, he was stuck to the ground and couldn’t be moved. So they left him chanting to all the plants everyday and night and they noticed that Ayahuasca was growing out from his fingers. So the sons went back to their chacras and after a month came back again, to see their father. Everywhere Ayahuasca ropes had tangled around him and still he continued chanting day after day and the forest carried on growing around him. After a few more months, he had merged with the forest itself and that is why its called Ayahuasca, rope of the dead and in Shipibo Oni.